While in the reception of the hostel waiting for my Aussie friend to come by, I met these two kiwi girls who happened to also be going to the terminal. So I asked if I could share a cab with them to the terminal. And well, they were also off to Puno and so we ended up traveling together. I was feeling really bad, really tired, maybe a bit of fever and well the stomach wasn’t all that great. After a 4h bus, we finally arrived to Puno. It is by the lake Titicaca at an altitude of 3850m. It was night time and the full moon shining onto the lake and all the city lights were on. It is actually a bigger city than what I expected, about 180 000 habitants and it is not really pretty. When we arrived at the station this lady offered us a place for really cheap and we would have our private bathroom so we accepted. We arrived and I had my own double bed and bathroom, which was quite nice. Lake Titicaca(which means Stone Puma in Quecha, or Grey Puma in Aymara the two indigenous languages and actually pronounced Titihaha), has a total of 40 islands. It is at an altitude of 3810m, making it the highest navigable lake in the world. During the 1970s, Cousteau explored the bottom of some parts of the lake, which has a deepest point of 270m. Much of the lake has still been unexplored. There are only small fish in the lake and some trouts but they do not get very big either. 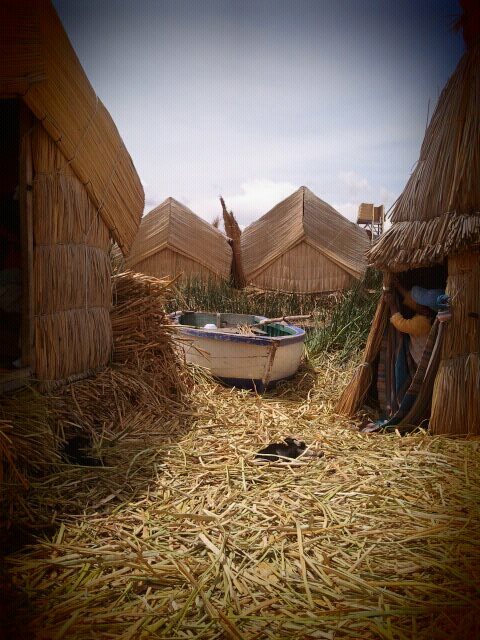 The next day we were visiting the floating islands, Uros, which is 7km away from Puno, on the Peruvian side of the lake. Most of the people living there speak Aymara, Quechua and Spanish. The greeting we were taught was: “Kamisiraki” which means hello, goodmorning in Aymara. The floating islands really do float. They use big blocks of earth and roots as a base, and top it off with an important plant called “totora”. They add new layers of this plant every 15 days during the winter and every month during the summer. When you walk on the islands, it is like walking on hay but you sink in just a little bit. They are about 2 meters thick. They also use the totora to build their homes, huts, furniture, and boats. It was really funny because they called their boats “Mercedes Benz” and at the end took us for a little ride, during which two men rowed us to another little island. They also eat the white part or the totora plant, which is meant to be very good for your teeth and health. They have a primary school on one of the islands as well, and afterwards the children go study in Puno. The visit to the island was informative, short and sweet. We got back to Puno and headed off on a 3h bus toCopacabana,Bolivia.